Louise, John and Cathy met with Fife Council and the park contractors on Wednesday 13 October. 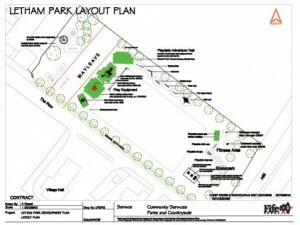 The park equipment should start to arrive week commencing 18 October and work will then begin. The contractor hopes that it should be completed in 4-6 weeks but this will be dependant on delivery of play equipment which is coming from more than one supplier. You can download a copy of the plans here for a reminder of how things will look when the work is finished. Fingers crossed it will all be done by Christmas and then we can look forward to getting our hands dirty finishing the shelter in the spring. OK so it didn’t start w/c 18 Oct, but any day now. I have had confirmation that the equipment has started to arrive with the contractor!